There's more to Chicago's food scene than just the iconic (and drool-worthy) deep-dish pizza. Chicago was just named the "best restaurant city" in America by Bon Appétit magazine. 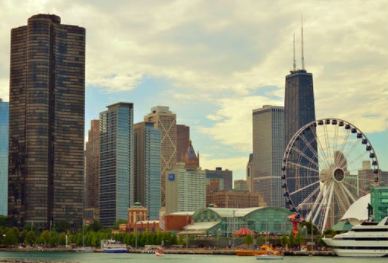 INSIDER delved into 10 reasons why Chicago deserves the honor. Chicago is an epicenter of molecular gastronomy. It is also home to amazing casual and cheap fare, and, of course, deep-dish pizza. When it comes to food destinations in America, New York and Los Angeles seem to constantly vie for our attention. After all, if you want to make it big as an American chef, you open a restaurant in either major city. However, we're completely unsurprised that Bon Appétit magazine unveiled Chicago as the "Restaurant City of the Year." From newly opened destination restaurants like Giant to classic budget fare like deep-dish pizza and the Chicago dog (with relish, peppers, and tomatoes), it's no wonder that Chicago has consistently been at the top of every food lover's watch list. Other parts of America will call deep-dish pizza a "casserole," but Chicagoans know better. Chicago deep-dish. Chicago dogs. Italian beef. The Windy City is well-known for its unique spins on American classics like pizza, hot dogs, and steak sandwiches (seriously, just try and tell them that deep-dish isn't real pizza or that tomatoes don't belong on a hot dog). We're just as impressed with their fierce passion for Chicago comfort food classics as we are with the foods themselves. The James Beard Foundation awards honor the best chefs, restaurants, and more around the country. Up until 2015, the James Beard awards, which present prestigious accolades to movers and shakers in the culinary community, were always held in New York. But then they made the move to Chicago's Lyric Opera House (where they will stay until 2021), making Chicago the official home base for the biggest food awards in the country. At the time, the James Beard Foundation said the city not only made them a "lucrative offer," but that the mayor was enthusiastic about introducing more "culinary tourism" to his city. Grant Achatz is widely renowned as one of the most popular chefs/practitioners of molecular gastronomy — the fusion of cooking and science — and Chicago is his home turf. You can experience (for a high price, of course) wild dishes like the "table dessert," which is prepared literally in front of you at Alinea, named the Best Restaurant in America by Business Insider. As for other fine dining institutions, Bon Appétit names John Shields and Karen Urie Shields' Smyth a "legendary" meal. 4. Multiple celebrity chefs like Stephanie Izard call Chicago their home city. Grant Achatz is not the only chef that primarily operates out of Chicago. Stephanie Izard has received multiple awards for her bold small plates at Girl & the Goat, and Rick Bayless' Topolobampo and Frontera Grill are two of the most popular restaurants in Chicago. You can even find food by Art Smith, Oprah's personal chef, at Blue Door Kitchen. Portillo's Italian beef sandwich will cost you less than $5 for a hearty meal. Even though we just listed some of the biggest name five-star restaurants in Chicago, you don't have to have deep pockets to eat amazing food there. You already know about Chicago dogs and pizza, but the classic Italian beef sandwich is an iconic cheap eats option for city dwellers (it's like a cheesesteak without the cheese). There are also greasy pierogis at Pierogi Heaven, and carne asada tacos at any number of the seemingly hundreds of taquerias around town. Hanbun is a "hidden gem" located in a food court in Westmont, Illinois. It specializes in bibimbap and bulgogi. As Bon Appétit points out, Chicago's can't-be-beat food scene even spills out into the surrounding suburbs. Hanbun is a food court at the International Mall in Westmont, Illinois, that serves cheap dumplings, bibimbap, and bulgogi on Styrofoam plates. But at night, the mall food court transforms into a seven-course chef's tasting menu that is so popular it has been booked through May 2018. Gastropubs have found a home in Chicago. Bon Appétit especially recommends the high-end bar food at Income Tax bar that serves unique bites, like "tender slices of octopus dotted with romesco sauce and meant to be scooped up with potato chips as you would nachos." Other bar food standouts include Hopleaf in Andersonville (known for the "world's best beer" and savory mussels), and Haywood Tavern at Humboldt Park, where thin serrano ham slices and whitefish dip are the stars. What constitutes a neighborhood restaurant? Perhaps it's an under-the-radar spot that mainly serves locals and tends to shy away from celebrity chefs and national media, but in Chicago, many of these restaurants are culinary destinations in their own right. Giant (another upscale gastropub) made the top 50 Best New Restaurants list published by Bon Appétit. They're well-known for their enormousbattered onion rings. Rick Bayless is not the only chef serving up unique and authentic Mexican food in Chicago. A newcomer is reviving the south of the border food movement in Chicago: Diana Dávila, the chef-owner of Mi Tocaya Antojería. At Mi Tocaya, you can find unique spins on classic dishes like peanut butter lengua and charred butternut squash tacos. Au Cheval's burgers need no words. If you ask a local Chicagoan where to get the very best burger, chances are that most will give you only one answer: Au Cheval. The juicy burger at Au Cheval is widely regarded as one of the best burgers money can buy in America. People willingly wait hours just to order one of these bad boys, and Bon Appétit once declared it the best burger in America.